Manufacturer and supplier of bells, carillon systems, chimes, church bell systems, tower clocks, and wwvb atomic time tower clock interfaces. Includes sound files of sample musical selections . Reviews and Comments for Maas-Rowe Carillons Inc. If the business hours of Maas-Rowe Carillons Inc. in may vary on holidays like Valentine’s Day, Washington’s Birthday, St. Patrick’s Day, Easter, Easter eve and Mother’s day. We display standard opening hours and price ranges in our profile site. We recommend to check out maasrowe.com/ for further information. 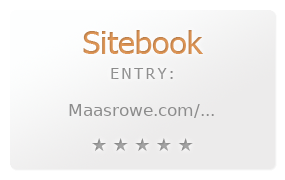 You can also search for Alternatives for maasrowe.com/ on our Review Site Sitebook.org All trademarks are the property of their respective owners. If we should delete this entry, please send us a short E-Mail.